The final section in Munch’s 1902 version of the Frieze of Life was almost entirely new from his earlier exhibition. He led into it with his famous painting of The Scream, and it is with that infinite scream still passing through nature that the artist takes us to Death. Edvard Munch (1863–1944), By the Deathbed (1895), oil on canvas, 90 x 120 cm, Bergen kunstmuseum, Bergen, Norway. Wikimedia Commons. 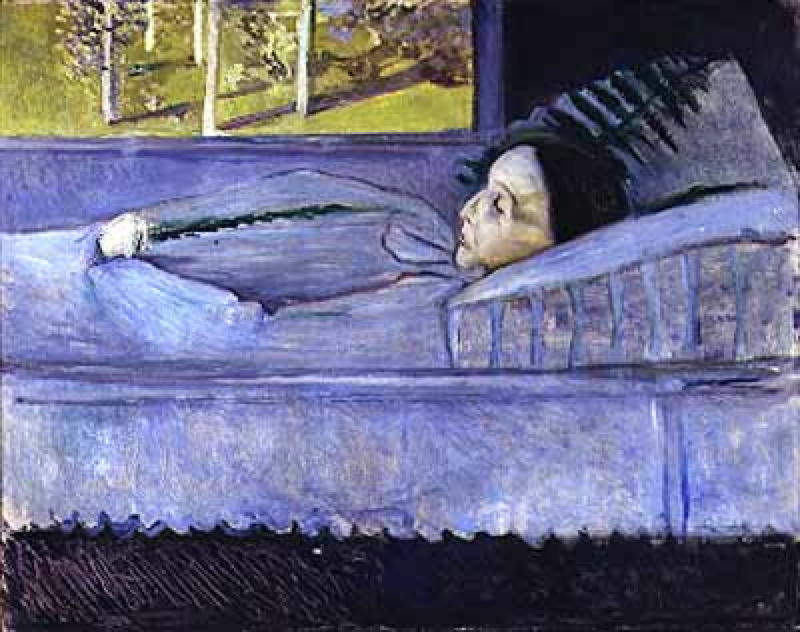 By the Deathbed (1895) is Munch’s painting from memory of his sister Sophie resting in her deathbed in 1877, when she was 15 and the artist was not quite 14 years old. She died of tuberculosis, an unfortunately common event at the time. Munch explained that, when painting from memory like this, he depicted only what he could remember, and was careful to avoid trying to add details which he no longer saw. This explains the relative simplicity of this and other paintings in this section. Sophie is seen from her head, looking along her length to her feet, her figure compressed into almost nothing by extreme foreshortening. Her deathbed resembles the next step, in which her body will be laid out in a coffin prior to burial. More than half the painting is filled by the rest of the family, father with his hands clasped in intense prayer. At the right is the mother, who had died of tuberculosis herself nearly nine years earlier. It is likely that a pastel version of this painting, dating from 1893, was that actually exhibited in the Frieze. That has a similar composition, with the addition of demon-like masks hovering on the back wall of the room. Death in the Sickroom shows another remembered scene from the end of Sophie’s life, which appears to have been earlier in her final illness, when she was still able to sit out in the high-backed wicker chair shown at the right. Nearest to the viewer, in the centre, is Munch’s sister Laura, and behind her is his other sister, Inger, who Munch quite often used as a model, particularly in this position. 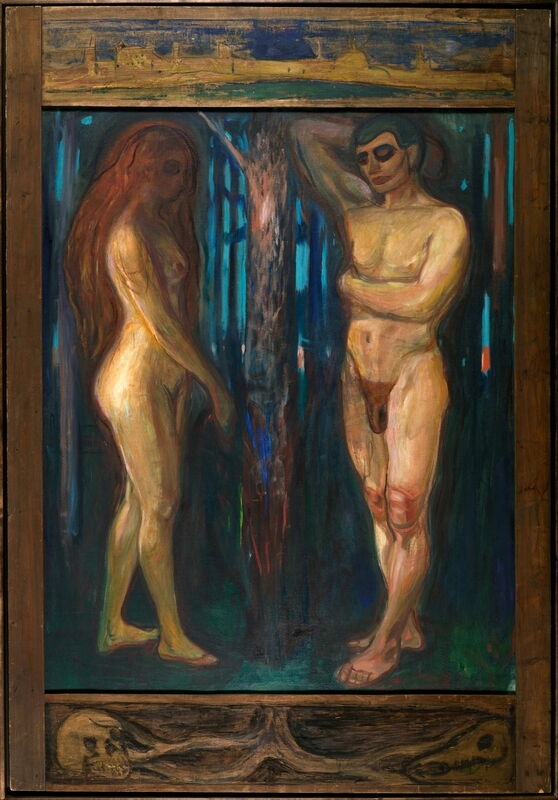 Munch himself stands behind Inger, with his face turned towards the dying Sophie in her chair. 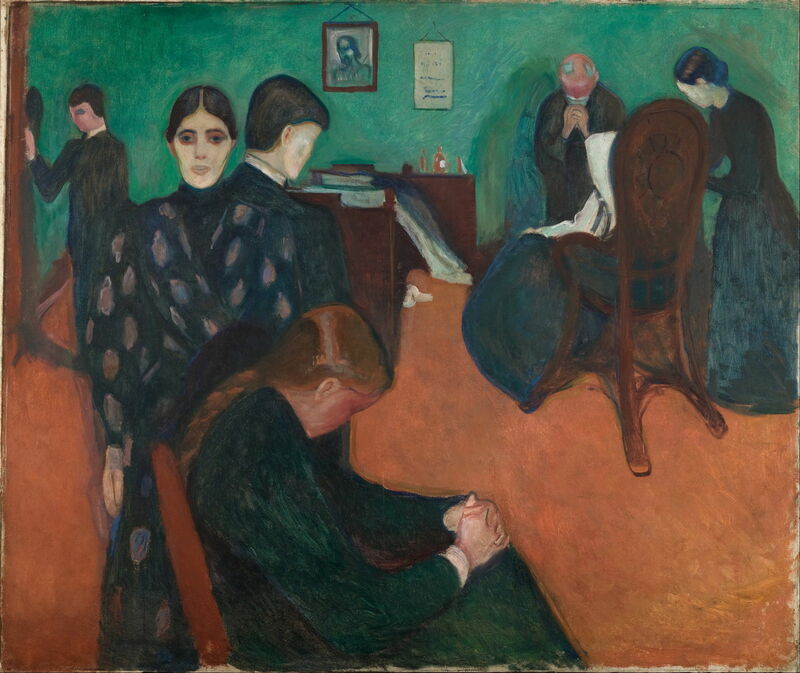 Munch’s father stands behind Sophie, his hands again clasped in prayer, and the woman tending to Sophie is the aunt, Karen Bjølstad, who brought the children up after their mother had died. The seeming absence of Sophie and distance from her siblings emphasises the loneliness and isolation of death. 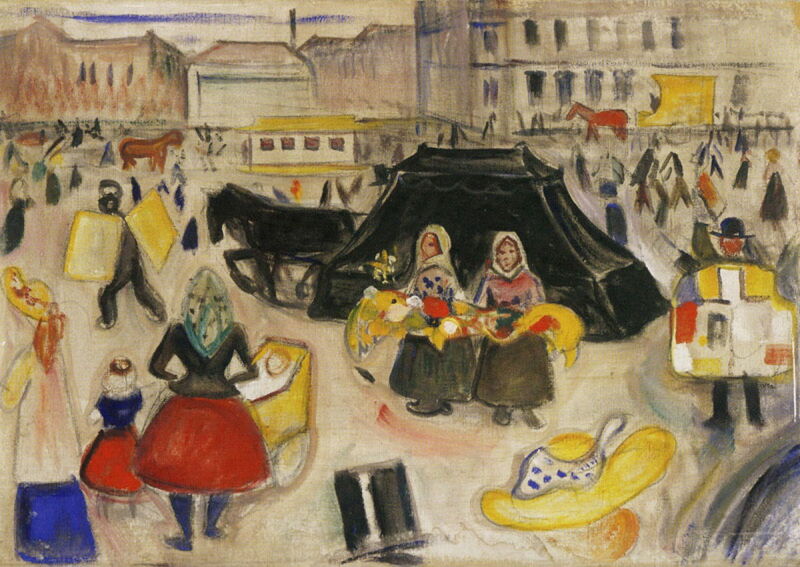 Edvard Munch (1863–1944), The Hearse on Potsdamer Platz (1902), 68 x 97.5 cm, Munchmuseet, Oslo. PubHist. Probably the least-known painting in the Frieze, there are two versions of Hearse on the Potsdamer Platz (above and below), both painted in 1902, either of which could have been exhibited in the series. They both appear to depict similar events, the presence of a horse-drawn hearse in this famous square in the heart of Berlin. They are unusual here in showing an outdoor scene using high-chroma colours. Amid those bright hues is the hearse, covered in a black pall, and drawn by a single black horse. This is the external culmination of the private process of death in the deathbed. 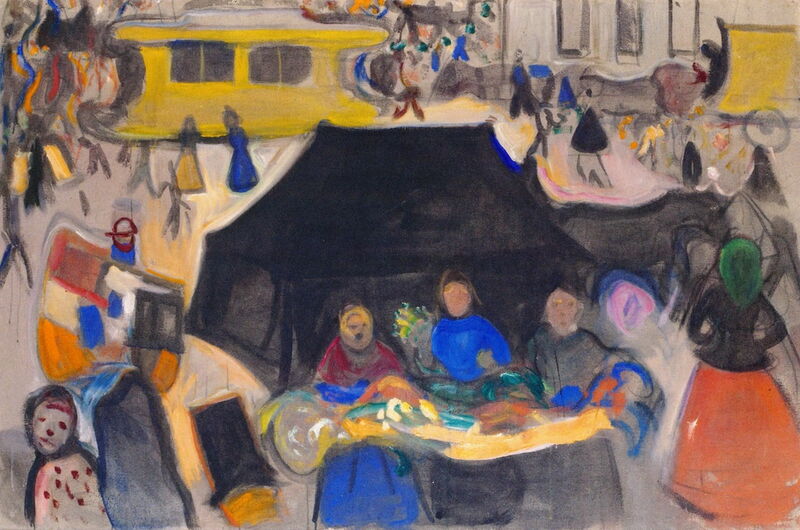 Edvard Munch (1863–1944), The Hearse on Potsdamer Platz (1902), oil on canvas, 110 x 166 cm, Munchmuseet, Oslo. The Athenaeum. Metabolism had been the key vignette at the end of the first frieze, and here in the second it is a ghostly reminder of the life before. A young man and woman have met in a dark wood, beyond which are glimpses of a ‘golden city’. At the time of its exhibition in the Frieze, there was an exuberant plant in the foreground between the two figures, in which there was a human foetus; this was overpainted after 1903. 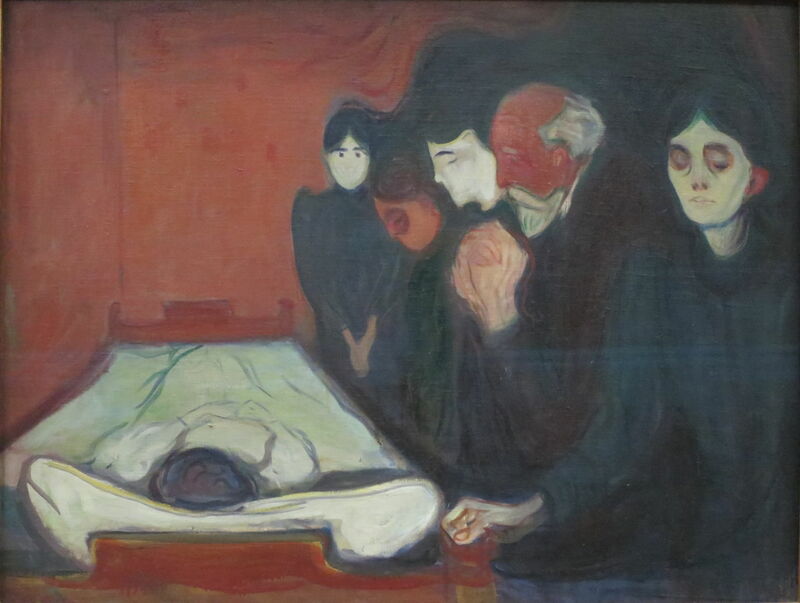 Dead Mother and Child can only be Munch’s later painting, made to augment the Frieze for its second version of 1902, showing his own mother in her deathbed in December 1868, when the artist was just 5 years old. She too died of tuberculosis, shortly after the birth of Munch’s sister Inger, her third daughter. In a room more resembling a wide, empty stage, Munch shows asynchronous and later forms of Inger, who would have been a baby at the time but here assumes her characteristic pose, their aunt Karin, Munch’s father, and Munch himself, as a young man. Sat at the head of the bed is the artist’s brother, Andreas. The young girl at the front is reminiscent of the foreground figure in Anxiety, which links the image to The Scream. Edvard Munch (1863–1944), The Dead Mother (1893), oil on canvas, 73 x 94.5 cm, Munchmuseet, Oslo. Source unknown. Munch had earlier painted The Dead Mother (1893), which was inspired by Max Klinger’s print The Dead Mother (1889), and the death of his own mother. Outside, the world is bright, sunlit, and green. Inside it is pale blue, and the mother’s skin has assumed the slightly cyanotic pallor of death. Behind her head is a fern leaf. This painting had been exhibited in Berlin in 1893, twenty-five years after his mother’s death. Perhaps Munch felt that is was a little too personal to include in the Frieze of Life. So Dead Mother and Child brought the series to a close, at least in its 1902 version. 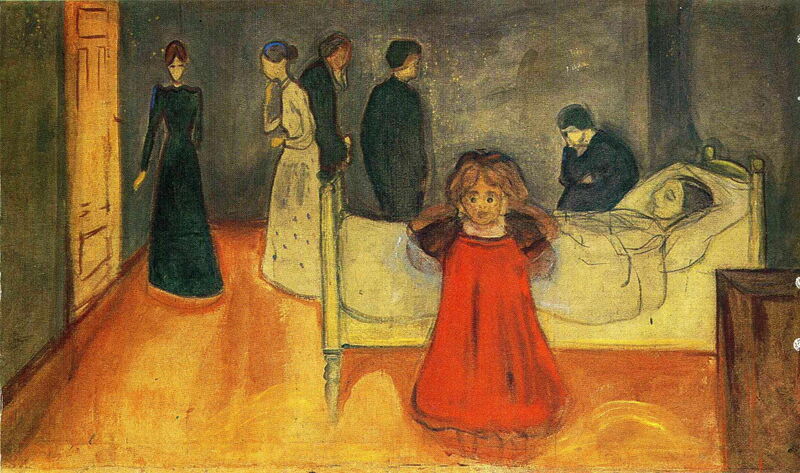 For subsequent exhibitions, Munch rearranged the paintings, and he showed strong preferences for others of his works, such as one of the many variants of The Sick Child which he had painted. But it is telling that on many later occasions, such as his seventy-fifth birthday in 1938, Munch was usually seen in front of one or more of the paintings in (or related to) his Frieze of Life. Posted in General, Life, Painting and tagged Klinger, Munch, narrative, Norway, painting, series. Bookmark the permalink.